A TOAST TO ARTISTRY. Stacya Silverman’s salon is also a gallery specializing in fine art photography. “I wanted to be surrounded by beautiful things,” she says. This article appears in print in the March 2019 issue. Click here for a free subscription. 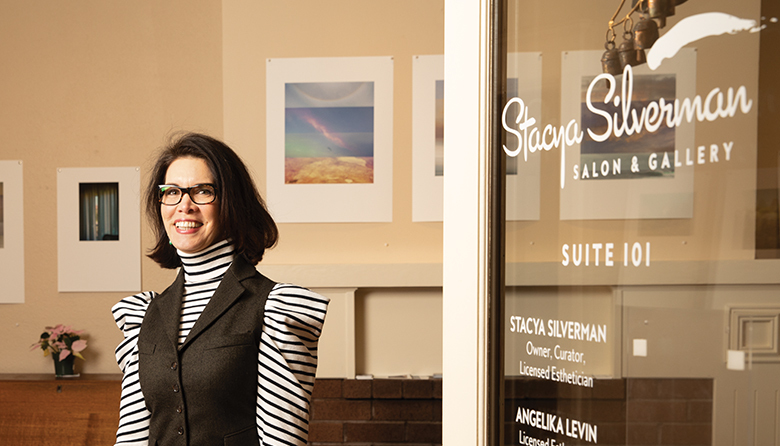 Stacya Silverman owns Stacya Silverman Salon & Gallery in Seattle’s Queen Anne neighborhood, where she waxes artful and funny. I’m an aesthetician, but a lot of times when I go to parties, people hear “anesthesiologist.” I get a better reaction to that. Sometimes. But if I’m never going to see them again, maybe not. Mostly, I do eyebrow waxing. But, since I own the business, I’m also the receptionist, the toilet cleaner, the supply orderer — everything and anything. Did you always want to be an aesthetician? Not at all. I majored in theater and thought I would go into not-for-profit management of the arts, but that all changed in 1991, when I was working at Seattle Repertory Theatre. One day, a computer showed up on my desk — I was a technophobe at the time — and I was sent to a computer class where I couldn’t understand the instructions and couldn’t make my computer do anything. And so, in a total panic, I decided two hours into the class that I had to find a way to make a living that didn’t involve computers. Within three months, I started beauty school. By the way, I later learned that my computer in that class was broken. Do you like to pick at things? Yes. In fifth grade, I made friends with a girl who had a habit of pulling out her eyelashes and eyebrows. I thought it was weird at first but then I started doing it, too. I conquered that habit, thank God, and transferred my obsession into pulling out other people’s hair. How do you handle those times when business is slow? When business slows down, I panic and think that I’m going out of business. My husband assures me that I’m not going out of business, I assure him that I am, and then business picks up and I stop panicking. Have you ever “gone out of business”? Is the aesthetician business affected by the state of the economy? Not really. In fact, when the economy bottomed out in 2008, I was busier than ever. People do give up luxury items but they won’t give up spending $12 to get their hairy upper lip waxed. Have you ever discovered something on a person’s body that ended up being a health issue? Lots. I had a client who came in for facials and she kept asking me to extract something off her nose. I knew it wasn’t a pimple and I told her she needed to get it seen and she kept putting it off. Turned out to be cancer that had bored into her cartilage and she had to have her nose amputated. Luckily, they were able to reconstruct it with the back of her ear and it’s beautiful. You’re known in Seattle as the “Waxing Queen” and the “Brow Shaper.” What’s the secret to maintaining attractive eyebrows? Do very little. The thicker and more natural they are, the better. Your beauty business is also an art gallery. Is there a relationship between waxing, plucking, skin care and art? I just wanted to walk into my business every day and be surrounded by beautiful things. And I don’t need the art to sell in order to pay the rent, so the artists aren’t under pressure. Hopefully, they sell. But it’s OK if they don’t. How would you describe your relationship to money? When I was young, we were always broke and we got evicted a lot, so when I got my first little jobs, like babysitting, I would spray-starch and iron my money to make it flat and perfect. Then I’d hide it from my father because he liked to borrow it for cigar money. If money were no object, what would your life look like? I’d give more to the causes I believe in. Shirley Chisholm, the first black woman elected to Congress. She’s my favorite because she had a funny voice and cat glasses and she got death threats and she still got up there and made her speeches. She was brave. I have three Shirley Chisholm T-shirts. Any advice you’d like to give to your younger self? Rather than cave to anxieties and fears, admit when you’re scared and get help. What four guests would make for the perfect dinner party? Shirley Chisholm, Julia Child, Beto O’Rourke and the Notorious RBG. As an audience member, what turns you on? I love drag queens! We lived in Hollywood when I was a little girl and my mom used to take us to these free talent shows that, in the early ’70s, had been taken over by drag queens. I think that’s what got me into cosmetics and wigs and high heels and dresses with big slits. Who doesn’t want to see a man all dressed up like a woman? No one!